We will Camp out on the side of the Mantua Community Center. This is a great opportunity for scouts and parents that are new to camping to be in a safe and familiar environment. Simple camping set up - Tent, sleeping bags, flashlight, camping chair, etc. Dinner and snack will be provided, and the community center bathrooms will be open to use. We will have many fun activities planned for both scouts and parents. What Is Camping like for Scouts, and Parents? Camping is the great outdoor adventure of the Boy Scouts of America. 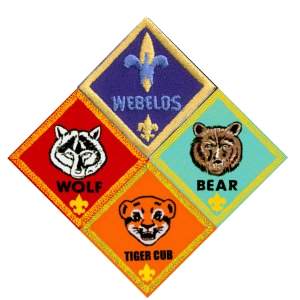 As a Cub Scout becomes accustomed to the outdoors with his den, he unconsciously absorbs some of the greatness of nature itself—the quiet of the forest, the cheerfulness of streams, the breadth of the lakes, the openness of the sky, the freshness of the wind, the beauty of the sunset. In working with nature to help provide food and comfort, a boy learns some of the skills, resourcefulness, and self-reliance and a lifelong source of recreation. 4pm-6pm: Set up tent sites, games and then dinner. 6pm -We will also host our 'round-up' (open house) for potential new scouts. Bring a friend!! !